If you like your dhal almost pureed, you most likely know that the dhal gutney is the best tool for this. 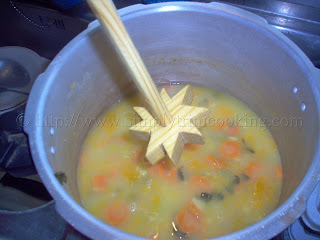 The Dhal gutney or dhal gutni (dal goot nee) is a wooden cooking utensil, common in local East Indian cooking, used especially when making dhal. After the split peas has boiled, the dhal gutney is used to break up the peas into a pureed consistency by swizzling it between your hands. It can also be used to swizzle callaloo. Now, if you are interested in making a dhal gutney I am pleased to tell you that it is very simple. If you have little experience with making any thing with your hand, I encourage you to challenge yourself. So lets save a little money. Don’t go to the supermarket for this simple kitchen tool. Just get yourself a good piece of wood and you can show off your creative skills. Now, I must stress that this is really simple to make and I know you will have lots of fun making it. 1. Print the dhal gutney template and cut out the pattern. 2. Centre the template on the pine board and draw around the pattern. Mark the centre also. 4. Measure 1/2″ on the drill bit and mark off by wrapping masking tape around it. 5. Drill the hole. When the drill reaches the masking tape stop. 6. Carefully hammer in the dowel in the hole. There should be a tight fit. 7. Secure the dowel in the hole by hammering the nail from the other side. Learn more about other cooking utensils like dhal gutney. Glossary of cooking terms….and some Trini ones too !